30+ essays celebrating the spectacular life of Barry Hannah. Contributors include Brad Watson, Dan Williams, Ron Shapiro, Jim Dees, M.O. Walsh and Glennray Tutor. Plus, never-before-seen interviews with America’s short story master. Once called “the maddest writer in the USA” by Truman Capote, Hannah greatly affected the lives of those around him and contributed to the careers of countless writers. He authored several critically acclaimed and best-selling books, including Bats Out of Hell, Geronimo Rex, and Airships. 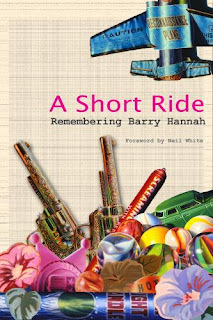 With an foreword by author Neil White, this collection of 39 short essays by fellow writers, artists, acquaintances, admirers, friends, and even once-enemies of Barry Hannah covers a spectrum of viewpoints on the extraordinary writer and man that he was. In his essay, artist Glennray Tutor remembers a time when he and Barry decided to rescue an abandoned speedboat from the clutches of time and kudzu—with Tutor performing the hard labor and Hannah verbally overseeing the process. Oxford resident Ron Shapiro writes of his adventures with his close friend, including spending an evening over drinks with Jack Nicholson and Hunter S. Thompson. Some people you "know about" but never get to know. Here's a chance to get to "know" Barry Hannah. A man who taught in Oxford for 28 years, wrote many novels and short stories and apparently knew just about everyone. But there was always the wall between the "knowing of" and the "knowing". If you have interest in getting to watch that wall drop, here's your chance to do so.